This past Saturday, September 8th, 2012, Scott T. Gill was signing books at Roma's Bookstore in Rockwall, Texas. His debut novel, Goliath Catfish, is a big hit with the Rockwall youth. Here’s a blurb about his book. Albert McClune is bigger than most kids in his neighborhood. He dreams of being his family’s hero, to turn their fortunes, and return the happiness lost with his brother Pete. But Albert is crippled by fear and shame. Fleeing home, he meets Elijah Amos Fortune Jones, an odd boy who takes him on a treasure hunt deep into the city sewers and uncharted caves. They face a voodoo priest, swim in rat-infested tunnels, and engage in a deadly race for the lost ransom of Machine Gun Kelly. Albert is forced to be courageous or lose everything he loves as he faces the guilt that has cut him down to size. ...but beware the man-sized catfish! A boy's Youth Adventure story, reminiscent of Huck Finn and Tom Sawyer, but a thrill to read for adults, girls, and boys alike. You'll feel you're under the murkish water with Albert, in danger of being eaten alive. Q: I understand that you’re a teacher here in Rockwall. Do you ever see yourself as a full time writer? A: No. I love to write but could never leave teaching behind. Q: What are your favorite genres? Do you have any favorite authors? A: Everything. I love all genres. Some of my favorite authors include C.S. Lewis, Tolkien and Twain. A: 5 a.m. every morning, without fail. Q: Are you a panster or a plotter? Do you always need to have a plan? A: Certainly a plotter. I like everything planned out before I start to write. Q: How can people find out more about your book? 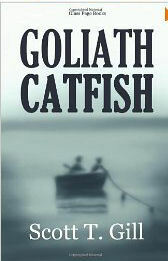 A: ‘Goliath Catfish’ is available on amazon.com or from my website. After serving as a minister for nearly 15 years, Scott left the ministry to pursue teaching. He is currently an English teacher and coach at J.W. Williams Middle School in Rockwall. He currently resides in Rockwall with his wife and four children.